I do most of my work in café’s with free wi-fi but even I have to say, HOLY CRAP did I walk into a Starbucks or a GD room at NASA?! Seriously, the other day I thought I was at NORAD and only at the last second was able to tell it was my local Panera because of the policy of bottomless iced teas! What I’m saying is that the other day at Starbucks, I asked for a mocha-frappuccino and it was prepared by a dude from the Geek Squad! The person behind me told them they were out of non-fat milk and they sent a god-damn IT guy to refill the canister! The barista asked me if I wouldn’t mind waiting a few minutes for a cup of coffee- I said sure, is it because you’re making a fresh pot?...He said no- I’m gonna make it on a Mac, but it takes a little longer for the software to come out! A woman ordered a chocolate chip cookie and they gave her oatmeal- the next thing she knows she’s on the phone with someone in India from tech support, trying to get the right cookie! 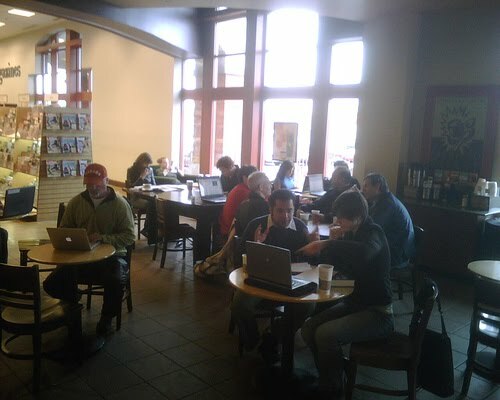 ...Please, join me in the comment section where you can feel free to add your own jokes about how many god-damn laptops are at your local Starbucks. And as usual, don’t be racist! It's not just Starbucks man, I heard McDonalds was changing its name to MacDonalds! And Applebees to Applebees! Oh wait...nevermind.